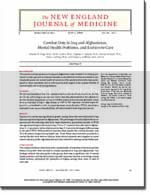 In the summer of 2004, the New England Medical Journal published the results of a ground-breaking study on the after-effects of a war still in progress. It remains the definitive report on the combat stress levels found in our troops returning from Afghanistan and Iraq. The first-ever wartime study of the mental health of combat troops appears in Thursday's edition of the New England Journal of Medicine. Previous studies of war veterans have been conducted years after combat ended. Four combat units -- three Army infantry units and one Marine unit -- that fought either in Iraq or Afghanistan participated in the new study. The 6,201 troops filled out anonymous questionnaires before, during and after deployment. The study found 17 percent of those who served in Iraq met the criteria for major depression, anxiety or post-traumatic stress disorder -- or PTSD. Eleven percent who served in Afghanistan met the criteria. But even worse, the study found, was that less than 40 percent of those afflicted by PTSD sought help. In [Sgt. Danny] Facto's case, a positive attitude toward treatment displayed by his commanding officers, family and fellow troops helped him overcome any stigma and get into the group therapy he needed. [He] benefited from treatment for post-traumatic stress disorder after returning from Iraq. "When I go to group and I talk with guys who are just like me it helps a lot, because I can discuss with guys that have been in combat, guys that have been shot at, guys who have lost friends in combat, guys that have killed other people," he said. Facto said therapy has made him a better father, soldier and husband. "When I came back, I was me, but I was different because of my experiences," Facto said. "Mental health and therapy really helps to understand everything I've been through." Despite the military's efforts, legitimate concerns about stigmatization and loss of career advancement remain -- a great price to pay, especially for career military officers. "Soldiers are concerned that coming to see us might harm their careers," said Maj. Paul Morrissey, chief of mental health services at Fort Drum in New York. "I can say to them sincerely, honestly that not coming to get some assistance will harm their careers." If you're having difficulty with your downshift into civilian life, please reach out and ask for the help you and your family need...and deserve. There are many resources ready for the taking.